Raindrop Technique was developed by D. Gary Young, the founder of Young Living Essential Oils; an aromatologist; one of North America’s leading experts on the art and science of aromatherapy; and an expert in the field of therapeutic grade essential oils. This technique involves dropping the oils directly onto the spine from about six inches above the body. The oils are then worked into the spine using light strokes with the fingers, which. stimulate energy impulses and disperse the oils along the nervous system throughout the entire body. In this way, the body can be brought into balance and the energy centers can be cleared and realigned. This method also helps to reduce spinal inflammations and to kill viruses that hibernate along the spinal column, as well as to help straighten any spinal curvatures. It will also complement other holistic modalities including acupuncture, chiropractic and laser therapy. How is Raindrop Technique Performed? Valor or Valor II essential oil is placed on shoulders and sacrum to harmonize energies of the physical, mental and emotional body. It is also placed on all four feet. Oils of oregano, thyme, basil, wintergreen, marjoram, Aroma Siez (optional), cypress and peppermint are applied to the spine from the base of the sacrum to the shoulders. Feathering and Vita Flex techniques are conducted on the spine to harmonize energies and allow the oils to penetrate deeper into the tissue. Ortho Ease, a massage oil blend, is also used during the technique. A hot towel can be applied to the spine for about five minutes if your dog is very cooperative! Usually horses love this last step but dogs (and cats) just won’t stay still long enough for this to be done! If your dog does decide to cooperate, then place the towel on the spine and add a light sheet or blanket over the compress to keep the dog warm. How Much Essential Oil is Used? Depending on your animal, one to two drops of oil is used for cats and small dogs and up to four or five drops can be used for large dogs and horse we could use even more oils. ZYTO’s innovative decision support technology takes the guesswork out of choosing nutritional products and wellness options for your pet. 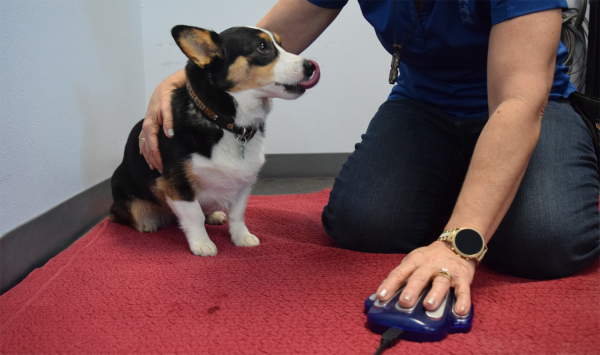 A simple ZYTO galvanic skin response scan can help inform your wellness decisions by providing accurate readings directly from your pet's body. 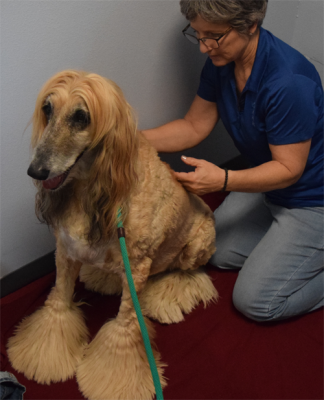 Schedule a Raindrop Technique or Zyto session for your cat, dog or horse, by contacting us by e-mail ( vcrcinfo@vetchiroandrehab.com) or phone at 713-991-9500.